Roger Chu, Research Director of LEDinside, a LED research subsidiary of TrendForce, interviewed two Close2Markets LED lights executives Ulrich Kastner-Jung and Peter Spiel recently. Kastner-Jung and Spiel have pioneered LED Lights, successfully initiated and managed LED lights business for more than 10 years. They are well renowned experts for western lights markets and see a huge opportunity for Asian Solid-State Lighting (SSL) players to expand. • At the global level, the competitiveness of Asian LED and lighting electronic manufacturers has winning potential. • The next growth wave will come from commercial lighting within intelligence and financial services. • Pure LED lights players have clear advantages, while traditional players will face restructuring challenges. SSL in Asia has made enormous progress. Light Fair Guangzhou 2013 clearly showed the high level of professionalism. Furthermore, how commercial lighting was approached demonstrates the powerful potential of Asian player. We strongly believe that the “time is right” to expand into Western LED lights markets to become one of the next global challengers. It is also “right on time” as the LED transition in western markets will now be pushed by commercial lighting. And finally it is “time to win” with traditional lighting players facing heavy restructuring. 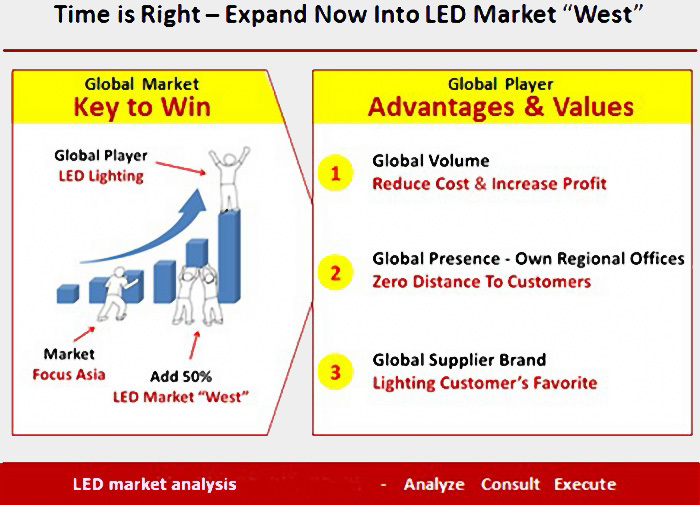 Time is mature for Asian LED manufacturers to "go west", according to Close2Markets analysis. • As competition in Asia increases, Asian manufacturers should use their competitive advantages in Western markets. • Benefiting from global volume and platforms manufacturers can generate profitability by economies-of-scale. • Strategic supplier wanted – customers buy from trusted brands that are global, sustainable, and comprehensive. As the majority of lighting will remain a price sensitive business - cost management is a high priority. Electronic LED lighting shows a huge potential to reduce cost by scale (volume, platforms). It is our recommendation to benefit from addressing the Western LED lighting market, which accounts for 50% of the global market. The first step for some players heading west is distribution sales. We strongly suggest evaluating the advantages of the company’s regional presence, especially in commercial lighting where lighting is an investment (higher value, long life-cycle, service demand) - customers require strategic, sustainable suppliers that have no distances with customers. Commercial lighting customer need to safeguard their lighting investments. Their favorite suppliers have the company ambition and financial power to establish own regional offices with proactive sales, marketing and customer care.